My daughter, paramedic Razan Al Najjar, was shot by an Israeli sniper while wearing her white uniform and trying to rescue those injured protesting for their rights. During Razan’s short life, she was confined to a densely populated, prison-like strip of land, surrounded by Israeli blockades and walls. She witnessed three Israeli military aggressions that wounded and killed thousands of innocent Palestinians. For her and for all of us Palestinians, the Great Return March is our cry for justice. As we stand together peacefully every weekend for the rights and freedoms freely given to others without hesitation, it’s the obligation of the international community to act and stop supplying Israel with the weapons that it used to kill Razan and so many others like her. I call on organizations and states to implement our Palestinian call for a military embargo against Israel so that we can live in freedom and peace. For more than seven decades, Palestinian people have been struggling to return to their homes from which they were uprooted in the Nakba in 1948. Israel denies us our right of return. 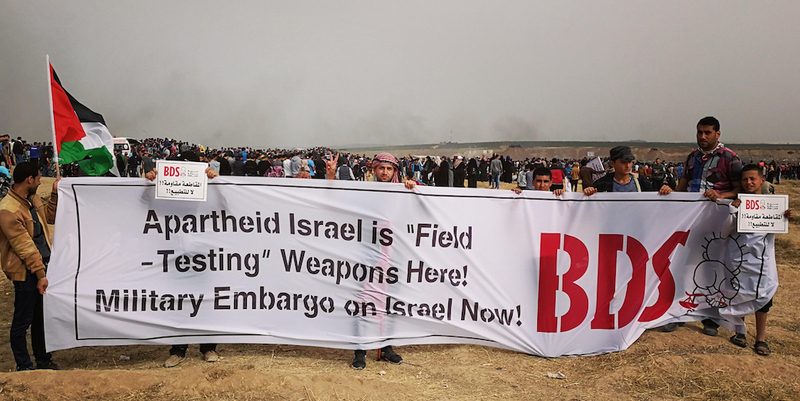 On the first anniversary of the ongoing Great March of Return in Gaza, we reiterate the call for boycott, divestment and sanctions for Palestinian rights. It is high time to fully isolate and prosecute the Israeli regime of settler-colonialism, occupation, and apartheid. The bloodshed in Gaza and elsewhere in Palestine must be stopped. As Palestinian citizens of Israel, we join the Great March of Return in Gaza in demanding the UN-sanctioned right of return for all Palestinian refugees. Like most Palestinians in Gaza, many 48 Palestinians were forced from our homes during the 1948 Nakba, and never allowed to return. We lived under martial law until 1966, and still suffer under Israel's apartheid laws. Land Day, which all Palestinians mark today, commemorates the day in 1976 when Israeli military forces killed six Palestinians in mass peaceful protests in the Galilee against Israel’s confiscation of their ancestral land. Israel must be held accountable for its crimes.